What are the prizes so far everyone has gotten? @bluewiz showed us in his room. 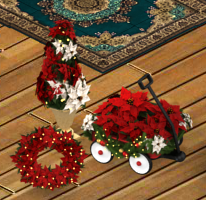 Poinsettia pin, poinsettia wagon, poinsettia wreath and poinsettia urn!